What do the Ferrari California and the Volkswagen Polo BlueMotion have in common? No, it’s not they’re both available in red (although they are). It’s that they actually both come with an engine start/stop system to reduced CO2 emissions. Yes, you read that right. It seems obvious in the Polo, after all it’s a small hatch designed to be cheap to run, but surely Ferrari isn’t concerned with efficiency? Well it is actually. The Italian brand says it’s possible to achieve low CO2 emissions while still maintaining Ferrari levels of performance. It’s serious too and in 2007 began an ambitious five-year plan to reduce the CO2 of its cars by 40 per cent. No easy task. Of course, Ferrari is probably the most famous name in automotive history and certainly the most evocative. It has created iconic sports cars and become a by-word for style, desirability and speed. However, high performance rarely means efficiency or economy. But Ferrari thinks it can change that. 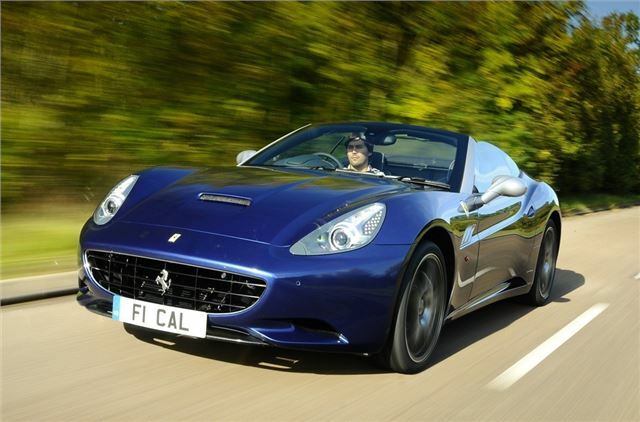 The California may have been dubbed the ‘baby’ Ferrari when it was launched, but while the California is the cheapest model from the Italian brand at a few grand shy of a mere £150,000, it’s far from being the 'poor' relation in the range. Powered by a V8 engine which drives the rear-wheels, the California is a front-engined grand tourer in the great tradition of Ferrari. It provides all the performance you’d expect along with an incredible sound that’s unlike anything else on the road – both from inside the car and out. On start up there’s a purposeful rumble while at higher revs it really comes alive. The performance figures are certainly impressive. The 4.3-litre engine develops 460PS which means the California can accelerate from 0-62mph in just 3.9 seconds with a claimed top speed of 193mph. And the engine itself is a work of art. No boring grey engine covers here, instead the red-topped V8 sits proudly on show. But the most intriguing part of this engine is the stop/start feature - probably the last thing you’d expect on a Ferrari. Stop/start systems sound straightforward in theory, but some are better than other. And thankfully the Ferrari one is in the better camp. Cleverly it recognises roundabouts and junctions by judging the amount of steering lock. Plus it leaves a slight delay before cutting out, to make sure you’ve actually stopped. This means that it doesn’t instantly have to start up again because you were only stopped for a split second. It takes just 230 milliseconds to fire back into life – which is basically very fast - but unlike starting the car on the ignition, it doesn’t roar into life. Instead it’s more of a muted sound. Admittedly it takes a little getting used to, mainly because it’s something that’s so unusual on a high performance car, but when you consider the fuel it’s saving, it makes perfect sense. The engine stop/start system isn’t the only efficiency measure of course. A significant part is down to weight. And with all its knowledge of F1, it’s something Ferrari knows plenty about. The chassis and bodyshell are both made entirely from aluminium while the California is the most aerodynamically efficient model in the Ferrari line-up. Other changes include a new fuel pump control, redesigned engine cooling fans that use less power and revisions to the gearbox shifts. All these combine to help cut emissions from 299g/km to a more respectable 270g/km. That doesn’t make any difference to the rate of VED on the California – it still sits in the top band M – but the reduction is still an impressive one. Fuel economy also improves – up from 21.9mpg to 24.0mpg. The California gets a new dual-clutch seven-speed gearbox as standard complete with an F1-inspired steering wheel that has paddle shifts. The gearbox is simply superb offering snappy and super-fast shifts with no drop in performance, which lets you exploit all that engine power and torque. With 485Nm there’s effortless pulling power, even at low revs and this really helps at low speeds. It’s impressively smooth and easy to drive in traffic and round town, which isn’t a usual supercar trait. It’s very comfortable too with a surprisingly forgiving ride, yet as you’d expect from a Ferrari, it is sublime in corners with great body control and superb balance although the steering does feel slightly artificial. However, it’s so agile you soon forgive that one minor shortcoming. It may be a grand tourer, but the California is an outstanding car to drive. It certainly gives you a lot confidence from behind the wheel , particularly at higher speeds, yet is easy enough to drive that it won’t intimidate those new to performance machines. The brakes are stunning too. The California is fitted with carbon ceramic brakes which are amazingly effective. They do take a little warming up and there’s not much progression in the pedal, but nothing matches it for stopping power. Inside, the California is everything you’d want it to be. Sporty, upmarket yet purposeful it also feels superbly built and bang up to date. There are some great design features like the metal ‘bridge’ that runs along the central console and houses the controls for the gearbox. The engine start button is on the steering wheel while the instruments cluster is dominated by a large rev counter, yellow-backed in our test car just so it stands out even more. The folding hard top is another highlight and it folds down neatly into the boot in just 14 seconds. With it down there’s actually very little wind turbulence, helped by the wind deflector. The California is actually a 2+2 which means it features two rear seats, although they’re so small they’re really only useful as extra luggage space. The sheer number of personalisation choices and optional extras is immense. Ferrari’s personalisation programme means you have a seemingly endless choice of everything, from interior colours and materials, carbon fibre trims, body styling extras, down to what stitching you have on the door panels and headrests. Few things are cheap of course – if you want the Ferrari shields on the wings as on our test car, it’s an extra £965. In fact our car came to more than £200,000 with everything on it. Is it worth it? Well, once you’ve driven one – the only answer is a big yes.